Casio first announced the G-Shock MTG-B1000 at Baselworld 2018. The solar-powered MTG-B1000 introduces Bluetooth connectivity to the MT-G line and has a more rounded exterior than previous MT-G models. 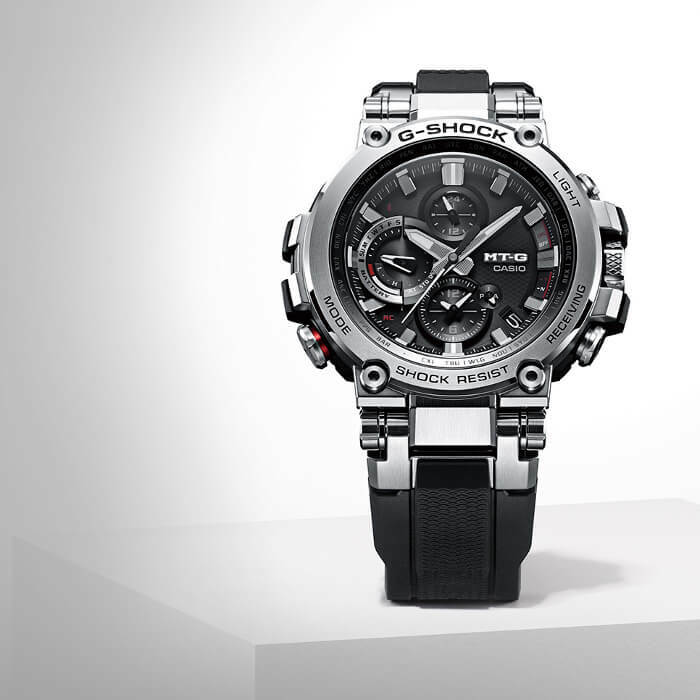 While constantly going bigger and bigger in recent years, Casio has taken a reductive approach to the MTG-B1000 with a smaller and slimmer exterior while retaining some signature elements like the round face and front screws. It looks similar to the previous MT-G models, yet quite different as if whole areas of the watch have been removed. 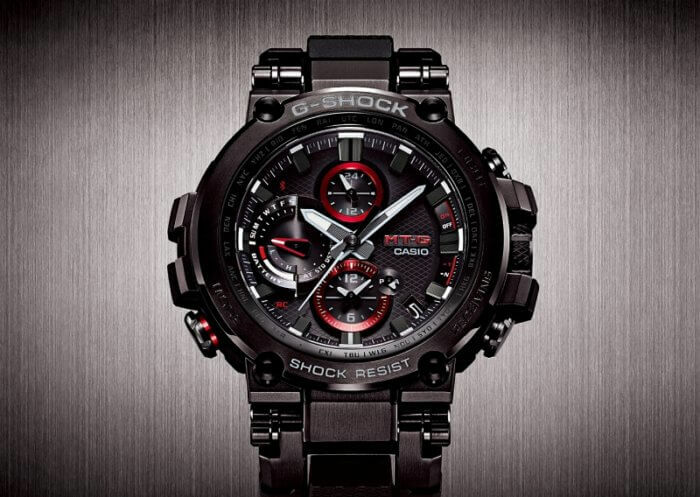 This is a distinctive new look for a luxury G-Shock and one that adds a new dimension of style and comfort. 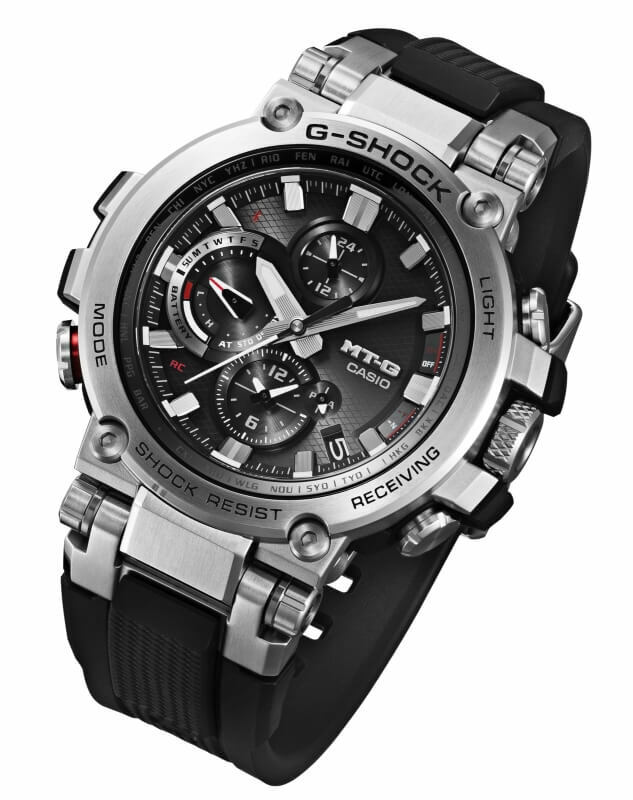 While the previous MT-G watches were known for their stainless steel bands, Casio is using soft urethane bands for these models. 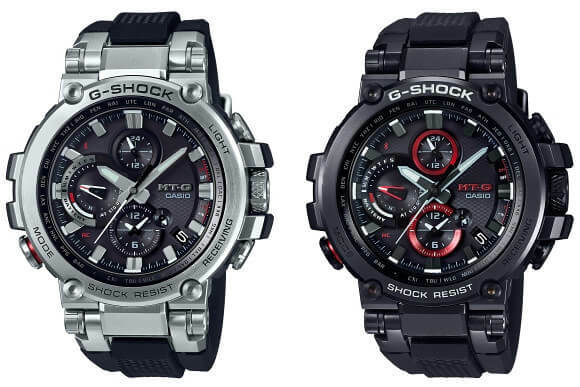 The MTG-B1000-1A (left) has a silver stainless steel body and a black band. The MTG-B1000B-1A (right) has a black IP body and a black resin band. The MTG-B1000B-1A4 has a black IP body and red resin band. Update: The MTG-B1000-1AJF and MTG-B1000B-1AJF will be released in June 2018 in Japan with a list price of ¥90,000 JPY and ¥100,000 JPY respectively. Update 2: Both the MTGB1000-1A ($800 USD list) and MTGB1000B-1A ($900 USD list) are being released in North America in July 2018. The MTG-B1000 has a similar core guard structure as previous MT-G models but with a new design that allows for a smaller and thinner structure. A carbon fiber reinforced inner case is housed in a box-shaped frame that connects the bezel, back cover, and band connector. The fine resin band is connected by metal parts and large bolts, ensuring a secure fit. 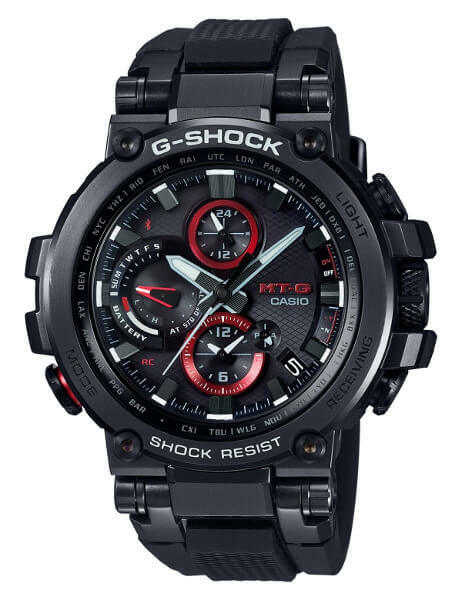 The measurements are 55.8 x 51.7 x 14.4 mm and the weight is about 123 grams (compared to 58.8 × 54.7 × 16.9 and 198 grams for the MTG-G1000). The new Bluetooth feature allows the watch to connect to a smartphone to adjust the settings with the G-Shock Connected app, and to automatically sync the time with internet time servers. The MTG-B1000 is also equipped with Multi-Band 6 radio wave timekeeping but does not have GPS timekeeping like the MTG-G1000. The MTG-B1000 has a sapphire crystal and metal parts that are polished to a hairline finish. It retains its signature features like Sallaz polishing and Triple G Resist (against shock, g-forces, vibration). MT-G models are manufactured in Japan at Yamagato Casio’s Premium Production Line. 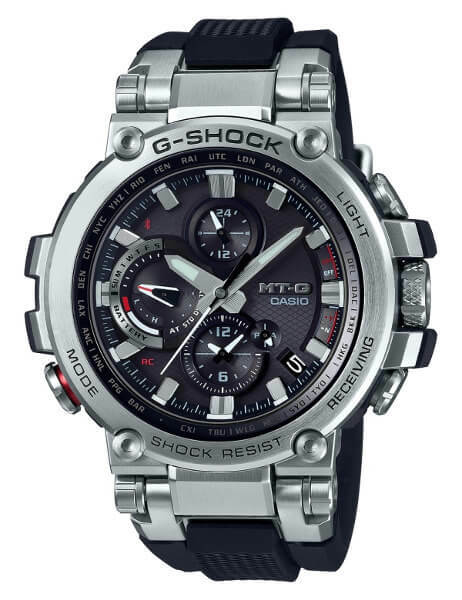 Full features of the MTG-B1000 include shock resistance, 200-meter water resistance, Triple G Resist, Tough Solar, Multi-Band 6, screw-lock crown, sapphire crytal with non-reflective coating, Neo Brite luminous hands, Bluetooth mobile link, world time, stopwatch (1-second, 24 hours total), countdown timer (24 hours total), time alarm, battery level indicator, power saving function, date and weekday display, and Super Illuminator LED light.